After landing just the night before in Manila, Philippines, Mandeep and I made a brutal 12 hour transit to the small northern town of Banaue. We couldn’t have asked for better weather. The sun is out and the sky is clear. We’re well rested (finally), and ready to strike out for a day of hiking adventure in the clean mountain air. 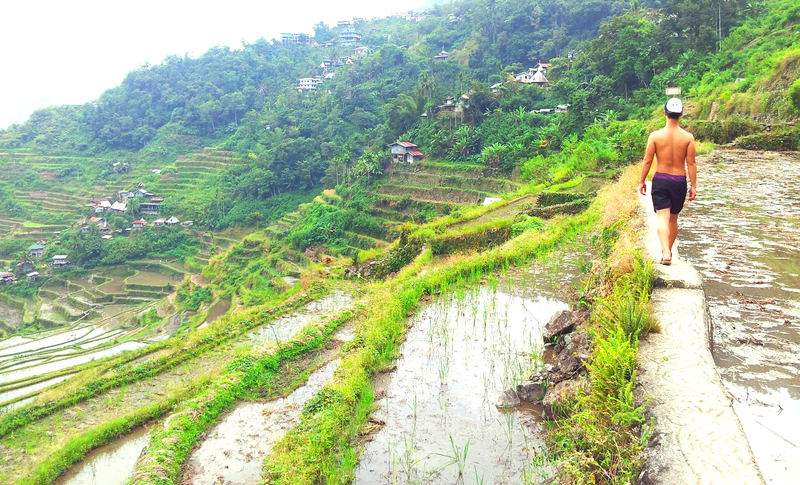 Most visitors to Banaue head to the more remote village of Batad as well, where there is another series of rice terraces. 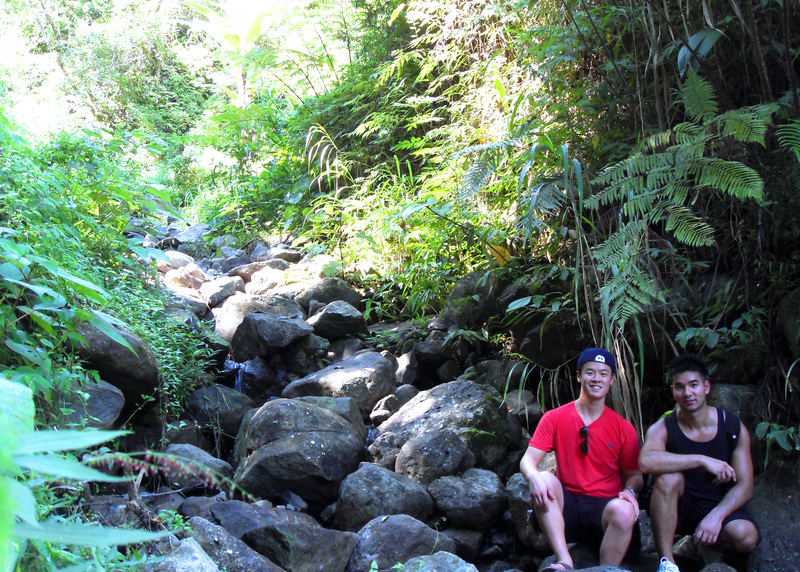 This involves a ride up the mountain and a one hour hike, returning on a different route which takes 3 hours. We decided to do it the other way around. We get dropped off by our tuk tuk at the end of a seemingly random road, which supposedly is the start to our backwards journey. Our driver informs us that he will be waiting at the bottom of the hill for us tomorrow at 9am to pick us up. Cool. Sounds easy enough (in reality the hike back was much harder and longer than we and we anticipated were freaking out that our driver would leave without us). We get dropped off here. To the right is a hut and the end of the road. The starting poin is where the tuk tuk is parked. Let the adventure begin! We start our 3 hour hike in a small footpath. Its not a path so much as the space between terraces where farmers will walk to get from one level to another. This was incredible! Instead of just looking at the terraces from afar, we got to walk along them. The hike is leisurely and it took us through mountains, cliff side walkways, small villages and more than our share of incredible views. This was the most green I have seen in a while. And don’t let the elevation fool you, it was very, very hot even before midday. 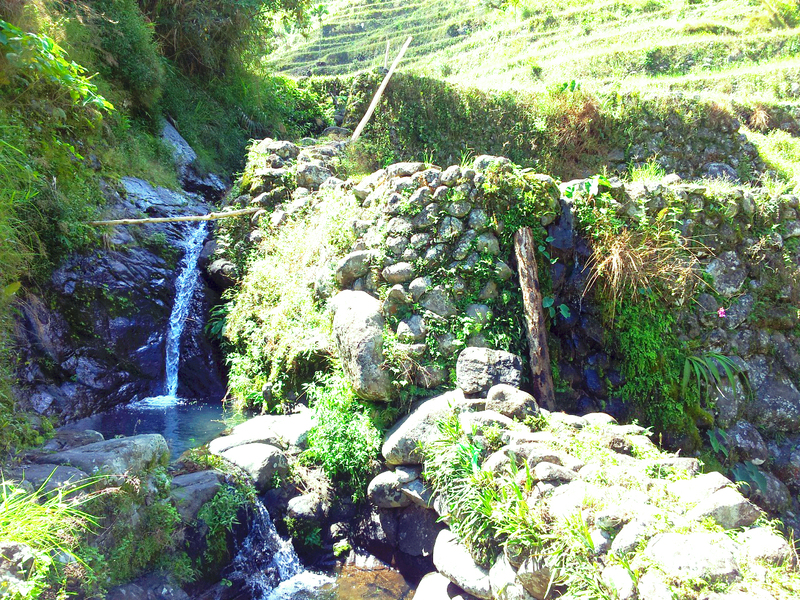 The hike from Banaue to Batad is dotted with with a few small, sporadic terraces. It took about 15 minutes before the sweat started flowing! Taking a brunch break? There was a shaded stream of sorts, one of the few cooler areas of the trail. Munched on some granola bars. Gotta say we lived on granola bars for the first few days of the trip due to our grueling transit schedule. You live and learn I guess? Made for some great stories later. A few areas on the trail where the trees would provide some shade. This rugged terrain remains mostly untouched by mass tourism. Mountains galore! Somehow these are different from the Rockies back home. Not better or worse, just different. This is close to the bridge where we had to decide which path in the fork we would take. The rocky ledges can be climbed to get from one level to another. There were a few huts at the top. Talk about a picturesque view from the home. Because the path is not marked at all, we were following instinct. We hike for the better part of 3 hours but there is no end in sight. 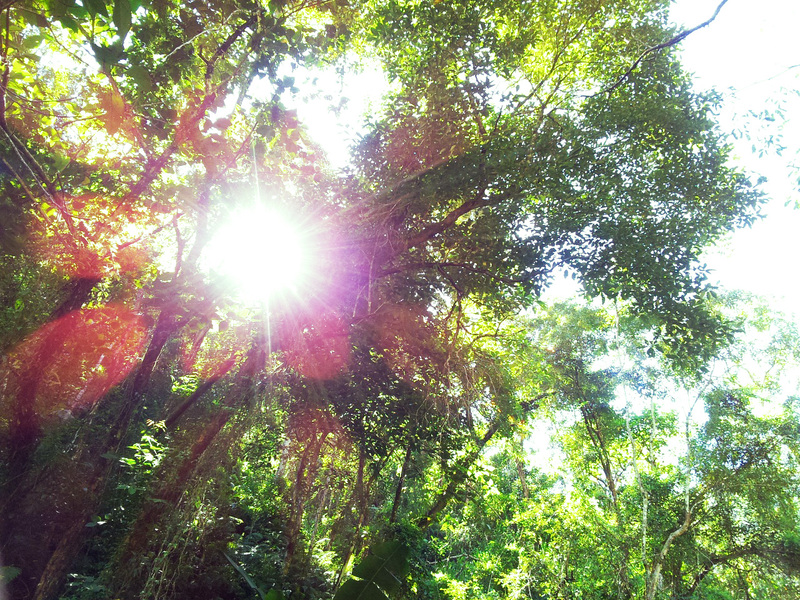 With the sun shining directly on us, and our water supply running low, we reach a small bridge which leads to a fork. One continues on the right, while the other leads up a dirt path (path is a generous description) cutting up a steep series of terraces. We honestly have no idea where we’re going so we’re stuck. We arbitrarily decide to just go up the hill. 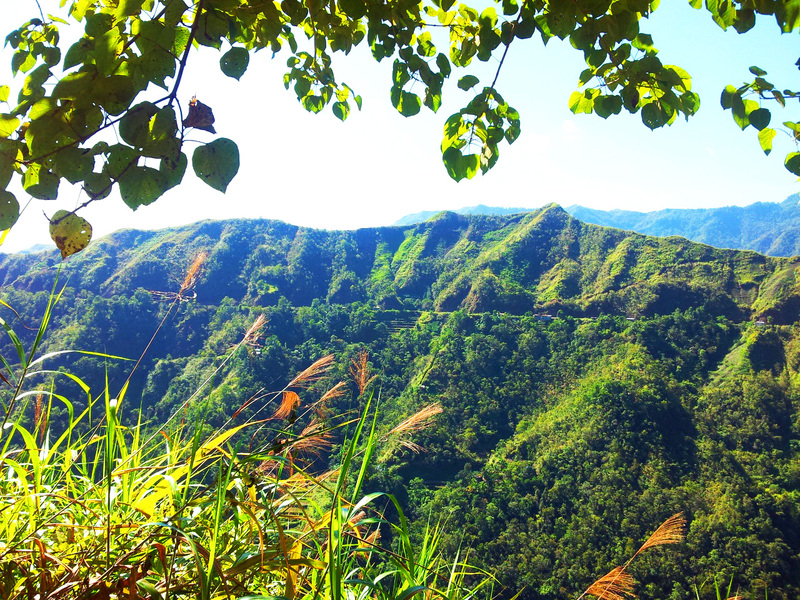 At the top, we finally see a sign the says “Batad Village” with an arrow pointing left. We follow a few youngsters carrying trays of water bottles down another path. On either side of us is foliage but when we emerge from the other side, we are greeted by the valley that holds the village of Batad. Batad is one of the oldest communities in the Philippines and its native peoples have understandably evaded the influence of colonialism most likely due to the harsh, remote terrain. We check into our guesthouse and have some lunch. Our room is very modest, literally 4 walls, a roof with 2 windows and basic bedding. No shelves, no table no nothing. Washrooms are basic indeed but at least they have toilets! No mirror however, so putting on my contacts was interesting. However, it boasts an amazing view of the whole village so we stay at the restaurant for most of the time here. The main inhabited part of the village sits quite high on the hillside. Terraces as far as the eye can see form a staircase from the first entry point (where we came in) down to the base of the mountain. Pano view from our guesthouse restaurant. Since most food items have to be carried up here by hand, prices are a bit pricier but still quite affordable. Maybe 20-30% more than what you would pay in Manila. We drank our share of beers with some locals here at night. Mandeep says there is a waterfall about 45 minutes from here that’s supposed to be quite off the tourist trail, although this was already not too touristy. We saw few westerners here but a number of local tourists. The hike was through dirt roads that cut through the terraces, with the final 25 minutes or so going down a steep set of stone stairs. At this point you get an amazing view of the adjacent mountains, which are completely carpeted in dense forest, and the distant rumble of water around the corner. One the way down the stairs we walk past a family trying to make their way down and I can’t help but notice the poor granny having so much trouble with each step. I hope they plan to carry her back up because there is no way she’s going to be able to climb these steep steps haha. 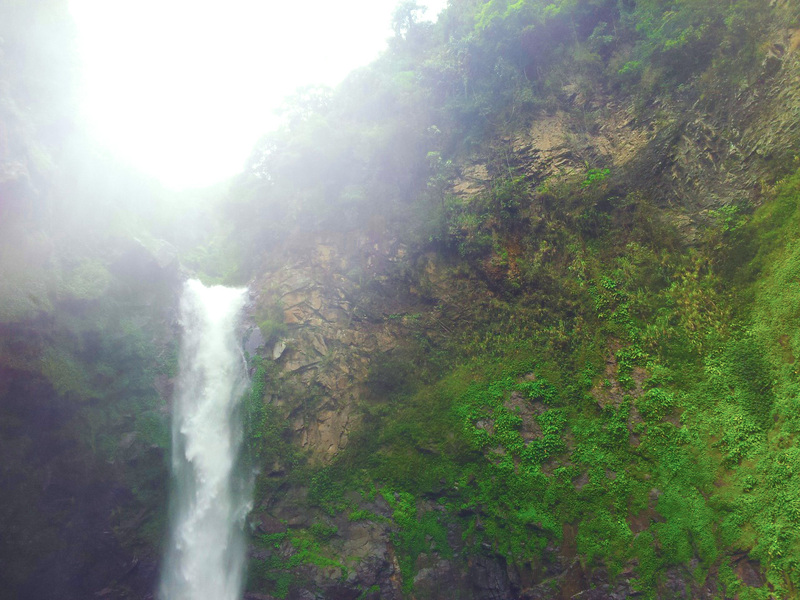 The waterfall itself is amazing. Tappia waterfall sits in the middle of a horseshoe shaped indent into the mountain and the walls surrounding are covered in moss and shrubs. The whole area around is misty and we are lucky since we only have to share it with about 20 other people. Sweet! The water is indescribably refreshing after the hike. With the humidity and the heat, we are drenched in sweat. I could have wrung out my T shirt! To anyone making the trip, this extra bit is well worth the effort. Our struggles and strain to make it all the way here are worth every drop of sweat and missed hour of sleep. This was definitely a travel high moment. There is a viewpoint that’s not too big a detour. Well worth the extra sweat! Beautiful in picture but absolutely amazing in real life. Attempting to take GoPro pics while swimming. 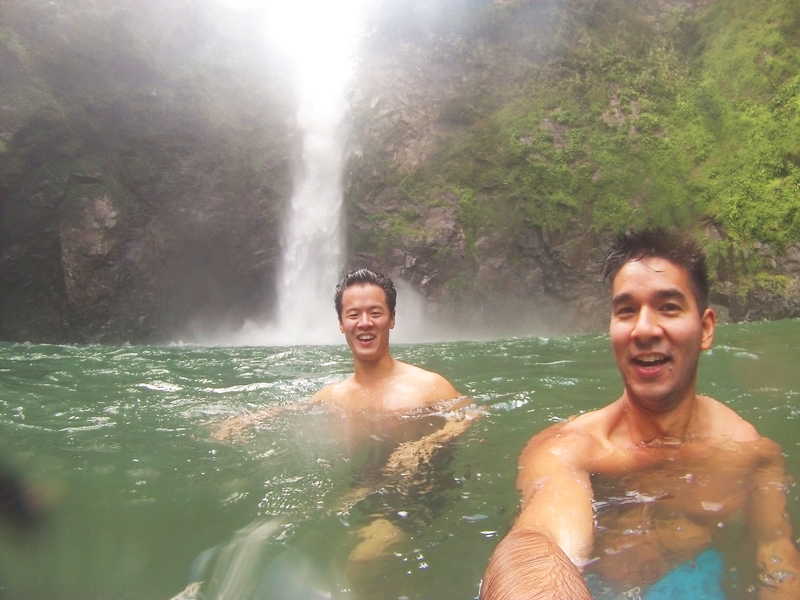 I tried to swim with the GoPro to the base of the falls but the current was just too strong. Plus I didn’t have my goggles haha. The rest of the day is spent cleaning up and avoiding those pesky mountain mosquitoes. Sunsets are really early here so we just chilled by the restaurant relishing the view and knocking back a few San Miguels. The gratifying feeling of accomplishment was fresh in our minds and our very sore legs but there’s really noting a few beers and a quiet night cant fix no? Walking back to our guesthouse from Tappia. Funny story, we were harassed by an old guy asking for money to take a bus back to Manila to fix his broken sandals. Go figure. 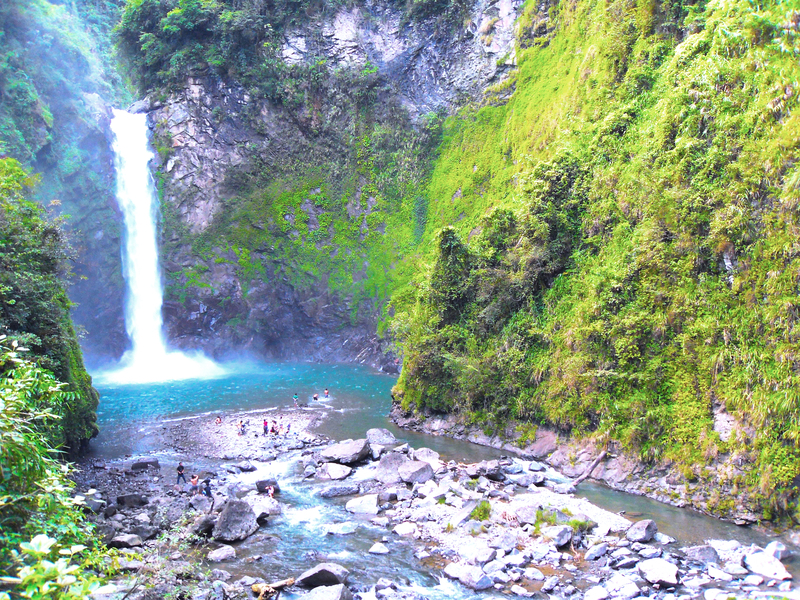 We made an overnight trip to Batad with Banaue sas our base. 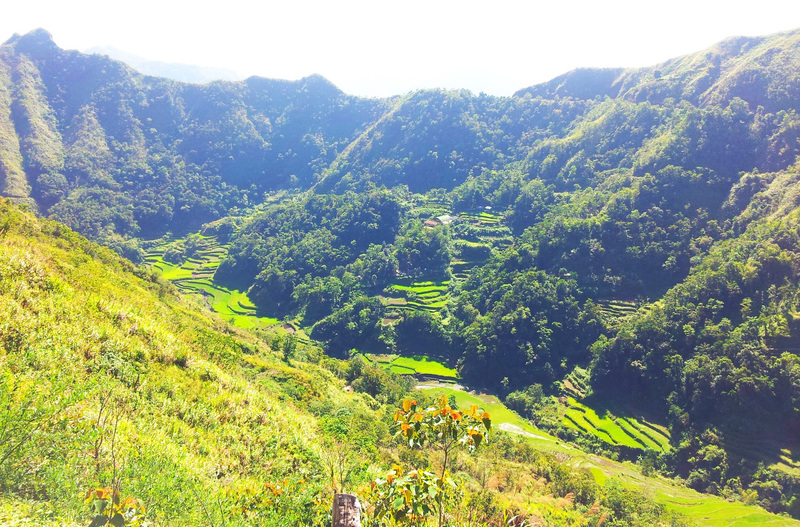 We left our big packs with our guesthouse in Banaue and took a day pack to Batad. No way you can do this with luggage. Electricity is at a premium here. Charge all your devices and bring an extra battery or battery pack if possible because to charge our device, you need to pay, then leave it at the bar unattended. ps. I love reading about your journeys! Jalan Alor is this long street in the Bukit Bintan area that’s pretty much all hawker style restaurants. some street stalls but mainly sit down type places where you order food from the stall and drinks from their neighbours. Food here is pretty awesome and you can get a huge variety of pretty much anything. It get super packed though so I would try to go earlier or later to avoid the dinnertime crowd. Jalan Petaling (spelling?) has a market. Its pretty much in the old Chinatown area. You can walk from Jalan Alor and it’ll take you about 15 minutes. Its only a bit faster by transit so I don’t know if you’d want to waste your money. The market is pretty standard stuff but on the eastern side there are lots of food stalls that have great, cheap food. There is one with a red sign called spicy pan mee that’s my favourite. The other stands along that street are really great too. Within the market there are some stalls that sell baked goods (got some good Kaya puffs there) and drinks. There are a few restaurants within the market too if you look around. Those are the 2 areas that I’ve gone to for food in KL that were memorable. Also, if you are feeling more adventurous, ask your hotel/hostel about Little India. There is a big Indian population there so the food is really good. The Indians here are predominantly from the south of India so their food is different from the Punjabi Indian style food that we’re use to in Vancouver. There is one place in Little India (I’ll be blogging about this later), where we got a huge pandan leaf of rice, curry, side dishes and condiments. You then buy your protein separately from the cash. Total cost of the meal was $3.50 CAD with a drink.